Off-street parking requirements prevent affordable, flexible "granny flats"
The United States has a large supply of residential garages that could be converted into affordable apartments. Unfortunately, off-street parking requirements prohibit converting most of these garages for cars into housing for people. 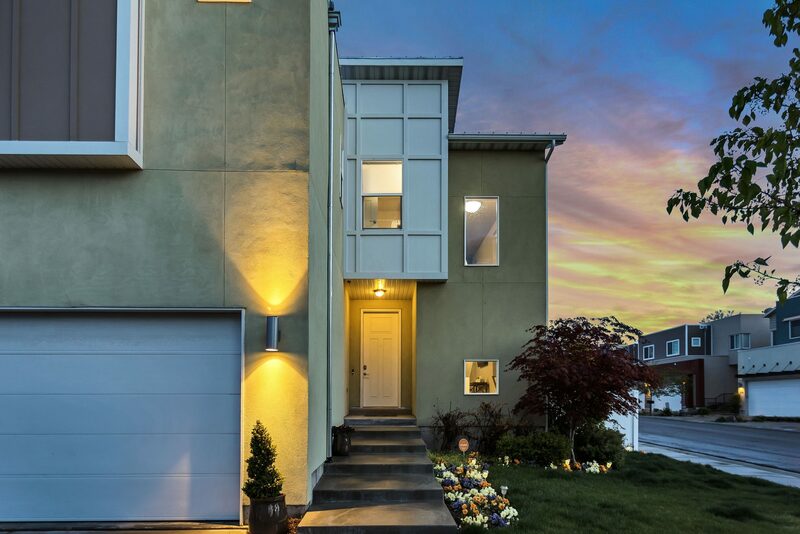 Converted garages in single-family neighborhoods are variously called second units, accessory dwelling units, garage apartments, granny flats, and backyard cottages. To convert a garage into an apartment, off-street parking requirements typically force a homeowner to replace the two garage parking spaces with two new parking spaces, plus an additional off-street parking space for the new apartment. 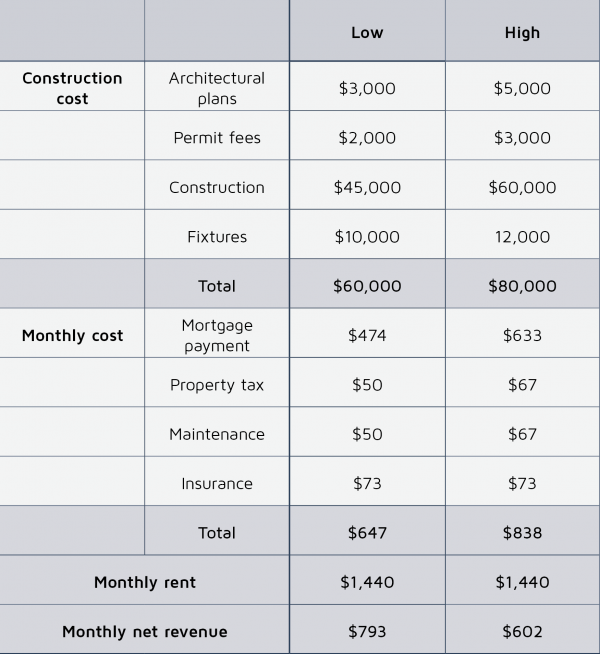 These parking requirements make it almost impossible — financially and physically — for most homeowners to legally convert garages into housing. To make conversions easier, some cities have removed parking requirements for second units. Although garage apartment residents are less likely than others to own cars, many do, and some of their cars are parked on the street. Thus, converting a two-car garage into an apartment can add three cars on the street, justifying the neighbors’ fears that the conversions will congest on-street parking. Residential parking permit districts can resolve the on-street dilemma. We propose that cities remove off-street parking requirements for single-family homes with second units, and limit the number of on-street parking permits at that address to the number of cars that can park in front of the property. Managing on-street parking in this way can reduce fears that converting garages into housing will flood the street with parked cars. Despite the need for affordable housing in cities across the country, many homeowners oppose garage conversions in their own neighborhood. Explaining why she opposed garage apartments, one planning commissioner in a Southern California city said that she bought her house in a neighborhood “where I wouldn’t have to worry if I was going to be able to park in front of my own house.” Garage conversions face severe political opposition if local officials fear that the new residents will create parking problems. This fear is exaggerated. A study of single-family homes in Los Angeles found that 75 percent of garages were used to store old furniture or other household goods, not cars. Photos from “Life at Home in the 21st Century: 32 Families Open Their Doors.” University of California Press. Used with permission. Figure 1 above shows two of these garages where cars are out and just about everything else is in. In addition, many older garages are too small to accommodate larger modern cars such as pickup trucks or sport utility vehicles. Garage conversions are unlikely to displace many cars from garages because many cars are already in driveways or on the streets. Nevertheless, many residents fear garage conversions will lead to overcrowded on-street parking. How can cities remove off-street parking requirements for houses with garage apartments without crowding on-street parking and arousing political opposition? Cities can better manage on-street parking rather than require off-street parking. Parking is not the only reason why neighbors may object to garage conversions, but it is a major reason and a politically powerful one. If on-street parking problems are no longer an objection to garage apartments, other reasons for opposition (such as concerns about noise or attracting poorer residents to affluent neighborhoods) can be discussed more openly. Other zoning regulations for second units (location, size, safety, construction materials, and occupancy limits) can remain largely unchanged. One way to manage on-street parking is to limit the number of cars permitted to park on the street. In residential permit parking (RPP) districts, the city can limit the number of on-street parking permits for cars registered at any address with a second unit. An RPP district is necessary, but not sufficient, to prevent garage conversions from crowding the curb. Although cities create permit districts only where parking is already scarce, they can be irresponsible about the number of permits issued. For example, a political firestorm erupted in San Francisco when journalists discovered that romance novelist Danielle Steel had 26 residential parking permits for her mansion in Pacific Heights. To solve the on-street parking problem, cities can impose an if-then condition for garage conversions: If an owner receives a permit to convert a garage into housing, then the owner accepts a limit on the number of on-street parking permits at that address. This if-then condition can be included in the zoning for single-family neighborhoods with RPP districts. Cities can also increase the number of on-street parking spaces by issuing block-your-own-driveway permits that allow residents to park on the street in front of their own driveway, effectively creating a reserved curb space in front of every house and increasing the on-street parking supply. If residents convert their garages into housing, these block-your-own-driveway permits can give property owners a guaranteed on-street parking space for themselves, guests, home help, and service vehicles. Off-street parking requirements in single-family neighborhoods prevent on-street parking congestion mainly by prohibiting second units. Most garage conversions that do occur are confined to the unregulated housing market rather than the formal market. Some homeowners ignore not just parking requirements, but also important safety precautions when converting their garages without building permits. These unregulated garage units often do not adhere to building codes, exacerbating existing concerns over the safety of converted garages. Unpermitted garage conversions and other second units are surprisingly widespread in the United States. To estimate the increase in the number of unpermitted single-family housing units in the 10 largest Metropolitan Statistical Areas, we compared the number of new single-family housing units reported in the U.S. Census with the number of single-family building permits reported by the U.S. Department of Housing and Urban Development (detached inhabited garages are counted as single-family housing units in both data sets). Column 4 in Table 1 suggests that, between 2000 and 2014, 37 percent of new single-family units were unpermitted. 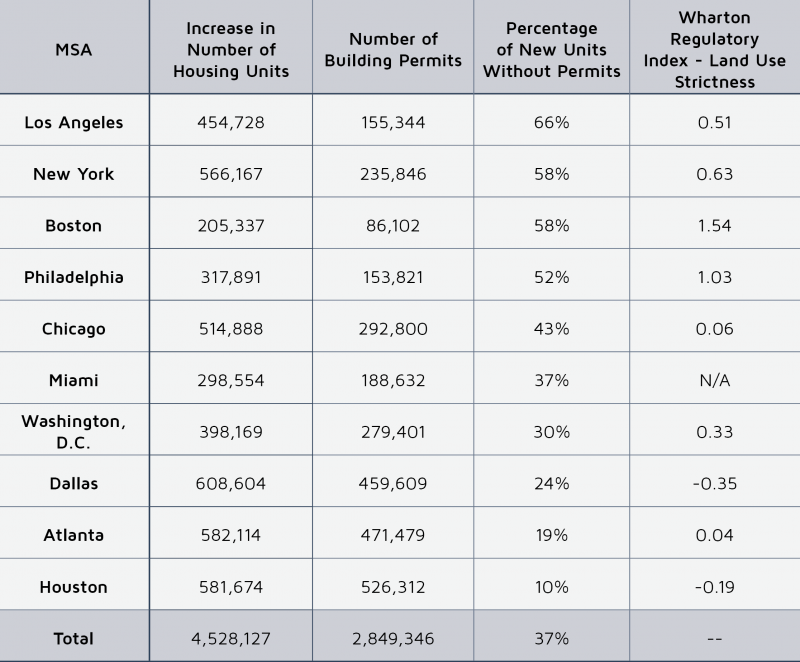 In total, 1.7 million unpermitted housing units were added in the 10 largest metros. The rightmost column shows the Wharton Residential Land Use Regulatory Index, which measures the strictness of land use regulation. MSAs with more regulation have higher values, and those with less regulation have lower values. The MSAs with more regulatory barriers to new housing (Boston, Los Angeles, New York, and Philadelphia) have high shares of unpermitted units in their metropolitan areas, while the MSAs with fewer barriers (Atlanta, Dallas, and Houston) have low shares. Providing a pathway to legalization can greatly reduce the number of illegal garage conversions. Converting garages into housing can have far-reaching benefits for homeowners, including improved financial footing. According to Pearl Remodeling, a company that converts garages into livable space in Los Angeles, the cost of converting a two-car garage into a 400-square-foot apartment ranges from $60,000 to $80,000. If the homeowner finances the conversion at 5 percent interest over a 15-year period, monthly loan payments would be between $474 and $633 per month. Using Craigslist, we surveyed rental listings of second units in Los Angeles County in May 2016 and estimated that the average rent for a 400–450-square-foot second unit in Los Angeles is $1,440. At this rate, the rent from a garage apartment can cover mortgage payments and give the homeowner between $602 and $793 in additional income per month. If the owner pays $60,000 for the conversion without borrowing, the rate of return on the investment is 25 percent per year and the payback period is only 3.9 years. If the conversion cost is $80,000, the rate of return is 18 percent per year and the payback period is 5.4 years. The large scale and poor design of some high-density infill projects often provoke opposition from homeowners who want to preserve their neighborhood’s physical character. In contrast, garage apartments do not overwhelm existing houses and may even go unnoticed by neighbors. 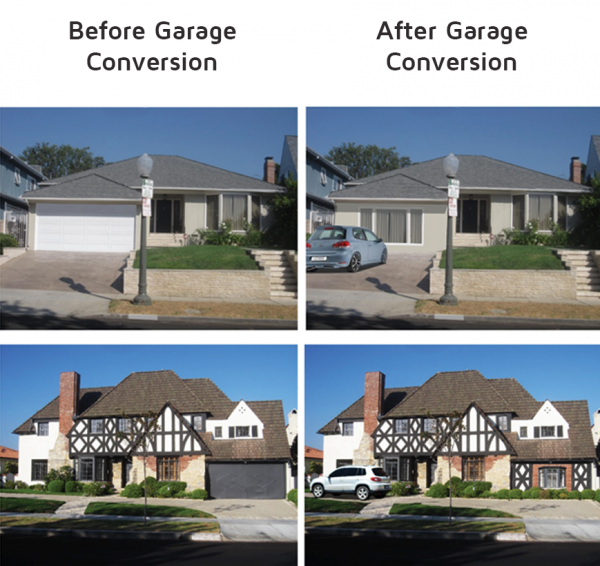 Garage conversions merely swap cars or storage for people, leaving exteriors virtually unchanged. Critics cannot say that a converted garage will be out of scale in the neighborhood because the garage is already there. Garage apartments create horizontal, distributed, and almost invisible density instead of vertical, concentrated, and obtrusive density. With a garage conversion, no one has to build more housing because it’s already there. The problem is that the city requires it to be reserved for cars, not people. Figure 2 below shows single-family homes with converted garages in front of and behind the house. 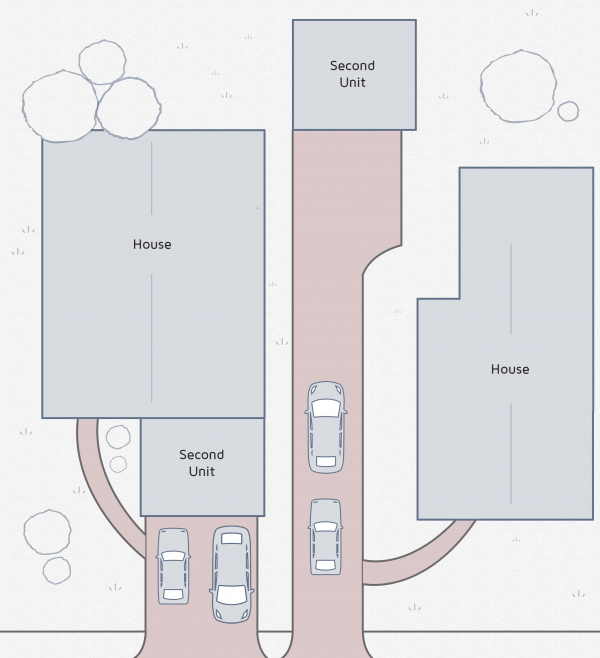 Both have enough parking to accommodate two, three, or more cars parked in the driveway or on the street in front of the house. Already comply with zoning-required setbacks and height limits. Do not reduce privacy in the homeowner’s or the neighbors’ backyards, and provide more privacy for the garage resident with a separate entrance to the street. Convert more cheaply than a freestanding backyard garage, as the apartment can connect with the electricity, central heating, air conditioning, and plumbing in the main house. Can have a door into the main house if the apartment is occupied by a family member or caregiver. Provide fire engines or ambulances with access, removing an objection often raised against backyard cottages. Make homeowners feel safer while they are away, with more eyes on the street if someone is living in the former garage. Improve both the architecture of the house and the urban design of the street, if implemented correctly. The two renderings below illustrate the design improvements possible when a residential facade replaces a garage door that formerly dominated the front of a house (the entry door to the second unit can be in the side setback). Parking reforms that allow second units can provide a new supply of small, well-located, and high-quality dwellings within walking distance of local stores and public transit. Smaller apartments have lower rents and will be more affordable to tenants with lower incomes. Allowing homeowners to convert their garages into second units will allow the market to supply more housing with less parking and less traffic. Garage conversions can reduce the demand for existing affordable housing by increasing both the number of small units and their geographical availability. If reformed parking requirements allow it, garage apartments can house communities of people with different incomes living not only within the same neighborhood, but also on the same piece of property. Garage apartments will be what has been called “naturally occurring affordable housing” (NOAH): units that are affordable without being supported by public subsidies. Because residents of new garage apartments will not be competing for the existing supply of affordable housing, the benefits of the new NOAH units will trickle sideways and benefit everyone seeking affordable housing. If a city limits the number of on-street parking permits at any address with a second unit, interest groups from across the political spectrum are more likely to support reducing the off-street parking requirements for second units. Taken together, reforms for both on-street and off-street parking regulations are likely to appeal to a variety of important interest groups. Housing advocates can see that allowing garage conversions will create affordable homes without requiring any subsidy. Environmentalists can see that it will reduce energy consumption, air pollution, and carbon emissions. Elected officials can see that it will encourage infill development and reduce traffic congestion without any new taxes. Urban designers can see that unobtrusive micro-apartments will enable people to live at higher density without being overwhelmed by cars. Older people can see the potential to have on-site housing for caregivers or boomerang children. Opponents of illegal second units can see the potential for cities to legalize or remove these units. Homeowners can see the opportunities for guest quarters or rental income. Across the political spectrum, the left can see that garage conversions provide affordable, mixed-income housing in good neighborhoods while the right can see they are 100 percent capitalist. By making it difficult to convert garages into apartments, off-street parking requirements put space for cars ahead of housing for people. Instead, cities should remove off-street parking requirements for houses within residential parking permit districts and limit the number of on-street parking permits at any address where a garage has been converted to housing. Limiting parking permits will prevent on-street parking congestion and help make garage conversions politically feasible. By increasing both home values and the supply of affordable housing, this parking reform can achieve both individual and collective benefits of converting garages into housing without creating costs to neighboring homeowners. Cities can offer parking reform for garage conversions first as a pilot program in one district. Pilot programs allow cities to act fast on big ideas. By starting small, a successful policy can easily expand into other parts of the city. Because they offer flexibility and may be adopted on a piecemeal basis, parking reforms that allow garage conversions can foster gradual change at the neighborhood level. A small parking reform will enable homeowners to create affordable housing and adapt the urban landscape to a new future, one garage at a time. Anne E. Brown is an assistant professor of planning, public policy, and management at the University of Oregon and doctoral graduate of the UCLA Institute of Transportation Studies. Vinit Mukhija is a professor of urban planning at the UCLA Luskin School of Public Affairs. Donald Shoup is a distinguished research professor of urban planning at the UCLA Luskin School of Public Affairs.